Happy Monday! I hope you are all doing well and enjoying life. I’m doing great! I had a lovely day of rest at home this weekend, spending time playing with Mana, reading, enjoying a warm, sunny Southern California day, doing some meditation, relaxing in a lovely sauna and watching a movie. 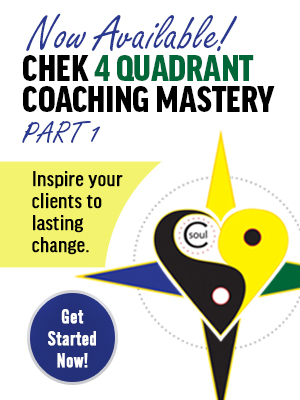 I’m happy to announce the launch of my new CHEK 4 Quadrant Coaching Mastery program! Penny and I, along with our staff, have invested more than a year in developing this new program and we are very excited that it is now live and available to you. I developed the CHEK 4 Quadrant Coaching Mastery program after working with my students, and consulting them when dealing with challenging cases, taking on problems that are classically categorized as medical failures and being very involved with health professionals of all types. I consistently saw that coaching patients/clients was a challenge for most exercise and healthcare professionals. As you are surely aware, human beings are very complex creatures. Life is much more complex than simply applying information or techniques. You can apply the best techniques to help a person heal, but if you don’t understand the beliefs and behaviors that led to their challenges, you are very likely to be treating symptoms. 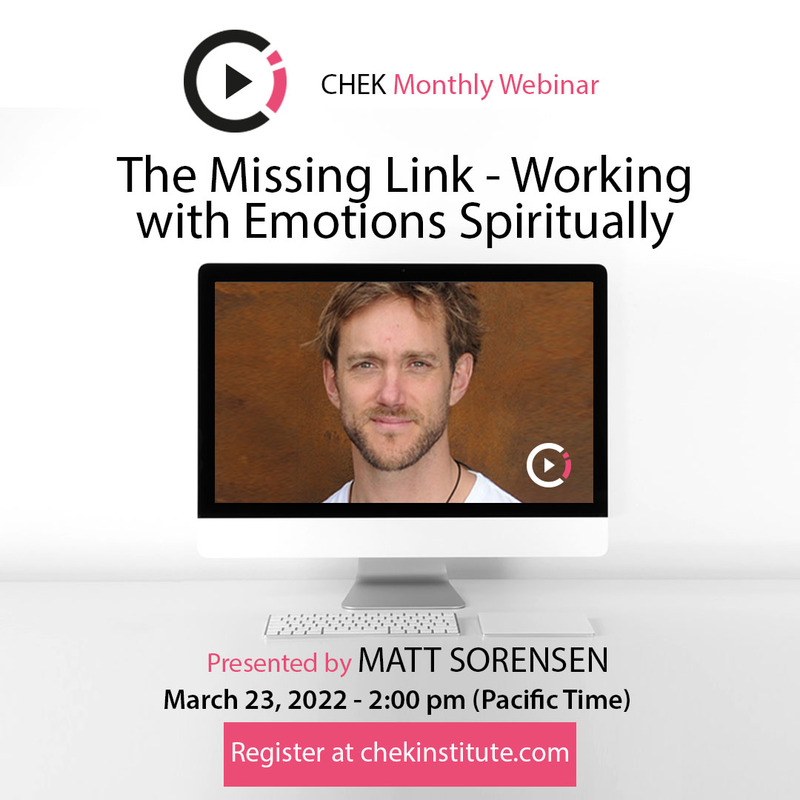 Help anyone who wants to grow personally, professionally or spiritually learn how to identify and heal emotional, mental and spiritual blockages. Help all people in leadership roles, be they trainers, coaches, therapists or physicians understand the intricate workings of the human psyche and how our mental-emotional experiences directly influence our bodies. By understanding how the psyche functions and how developmental challenges can set up fields of resistance to growth and development, coaches, therapists and doctors can effectively identify where the emphasis is needed to support the healing process for long-term results. Understand the importance of archetypes, myths (your life story) and counter-myths (what pains are being generated by living one’s life story) and how to effectively heal blockages that limit healing and the creation of your dreams. Give individuals or professionals the tools to explore their own inner world and practice healing methods so they can clear blockages and gain awareness of powerful healing tools and methods so they intimately understand the process you will guide others through. Help parents understand the formative forces that influence the inner world and overall development of a child. Sadly, MUCH of what limits people as adults has its roots in childhood developmental challenges, such as divorces, broken families and abusive parents. CHEK 4 Quadrant Coaching makes parents more aware of how to best support their children in achieving their dreams, and even how to heal their own challenges so they have more awareness as parents. Although there are three more parts in final production now, Part 1 is up right now, so enjoy this first lesson for free! Matt Nichol with me after a hard workout! Today in my vlog, I continue my interview and sharing with Matt Nichol, one of the world’s greatest and most successful strength coaches. Matt has studied my teachings since 1996 and was one of the first CHEK Professionals to practice in Canada. Also, he was influential in exposing my teachings to the strength and power community through his contacts, and introduced my lectures at Dr. Ken Kinakin’s Society for Weightlifting Injury Specialists (SWIS) first two conferences in Toronto. At those first SWIS conferences, I unveiled Nutrition: The DIRT Facts (available on DVD), or broken into 10-minute segments on my YouTube channel. This presentation was one Matt knew would be quite “out of the box” for the strength/power community. However, during his introduction, Matt encouraged people to pay attention, because he recognized the benefits of eating organic and the importance of healthy soils and healthy, clean foods for athletic performance. Interestingly, I was recently on a nutrition panel at canfitpro world fitness expo in Toronto, and one of the panelists was nutritionist Josh Gitalis. After the panel discussion, Josh informed me that 10 years ago, he was at a place in his life where he wanted to make a career change, and wasn’t sure what to do. Josh was at my Nutrition: The DIRT Facts lecture at the SWIS conference the day I shared it for the first time. He told me my presentation blew his mind, it inspired him to study nutrition and whole foods eating, and ultimately led to him to being on the panel with me that day! Matt and I have been friends all of these years, and I’ve served as a consultant to him and the Toronto Maple Leafs during the seven years he was their conditioning coach. The influence of the C.H.E.K Institute teachings led Matt to explore ways to provide athletes with high quality nutritional supplements, recovery drinks and related products, which he now produces and sells through his company, Biosteel. 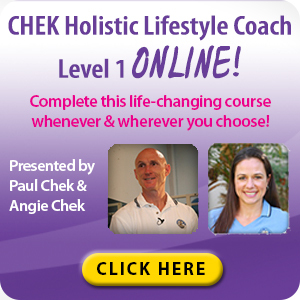 The myth that CHEK Professionals are weaklings who only use stretch cords, pink dumbbells and Swiss balls. Is that really true? Matt’s relationship with me and what led to the creation of his athletic nutrition company, Biosteel.